While in New York, I attended a number of ongoing workshops led by such musicians as Sam Rivers, Barry Altschul, Lee Konitz, and Ornette Coleman, among others. I also joined German multi-instrumentalist Gunter Hampel and the GALAXIE DREAM BAND, with whom I recorded two albums. (I was fortunate, while performing with the GALAXIE DREAM BAND, to make the acquaintance of trombonist Marty Cook; now living in Germany, he continues to express himself with some of the most delicately beautiful sounds I've ever heard from the trombone). 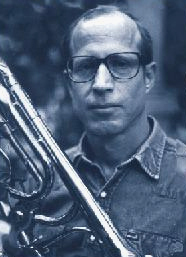 During this time, I had the privilege of studying with trombonist Garrett List, one of the finest, most versatile and fluent trombonists in both classical and jazz id ioms, especially the avant-garde reaches of both disciplines.